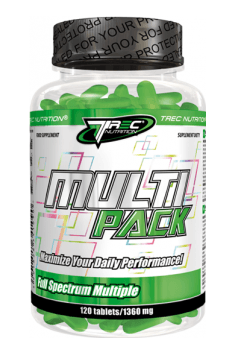 Multipack is a complex composition of vitamins, minerals and metabolic activators which reinforces bodily strength in physical or mental stress conditions. As the result of stress, poorly balanced meals or intensive workouts, the requirements for substances which are key for fitness and vitality are increased. Multipack is recommended as a daily dietary supplement and a source of easily absorbed vitamins and minerals for every person who is physically or mentally active. The recommended daily dose is 1 tablet 2 times a day, preferably immediately after a meal. Wash down the preparation with 300 ml of water. Maltodextrins, capsule shell (gelatin, dyes: titanium dioxide, iron oxides and hydroxides, patent blue V), anti-caking agents: magnesium salts of fatty acids.